HomeAdditionPlus.com’s “HouseSight” service is now helping connect custom home furnishing makers with consumers and homeowners. If you’re a custom furniture maker or a home décor craftsperson looking for new customers, HouseSight can help expand your business. 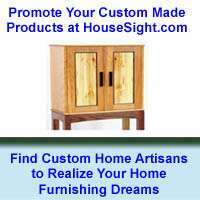 At “HouseSight” custom home furnishing artisans can create individual project web pages and upload pictures, descriptions and even videos of their handmade products for consumers to view. In addition, the home furnishing maker’s “HouseSight” profile information, including contact information and a link to their own website, can be displayed on each project page created. There is no limit to the number of project pages that an artisan can make, and most importantly, “HouseSight” is a totally free service for both artisans and consumers. For consumers and homeowners, HouseSight is the ideal place to obtain home furnishing ideas and connect with skilled craft makers that can produce the type of custom home furniture or home décor accessory you’re looking for. While searching HouseSight if you see a particular piece of custom home furniture or home décor accessory that you like, you can contact the artisan who produced it and commission them to make you a similar item. Since the products are all custom hand crafted you can also work with an artisan to define and create a particular item you’re looking for. At HomeAdditionPlus.com and HouseSight, we believe a new house is simply a shell, or if you will, a blank piece of canvas, until it is personalized by a homeowner’s touch and tastes. And only when the house is fully furnished and decorated by the homeowner does it truly become a home. By working with a skilled home furnishing maker you can better realize your own unique style and tastes for your home. In addition, the furnishing and decoration of your home becomes more of a personalize experience then simply buying off-the-shelf products from a local big box store. Moreover by commissioning an artisan to build your custom home furniture or home décor piece your helping to preserve a small business and ensure the future availability of fine handmade home products. So whether you’re a skilled custom home furniture maker or a home décor artisan register on HouseSight today and begin promoting your crafts and business. And if you’re a consumer, visit HouseSight to find the home furnishing artisan that can help realize your custom home furniture and home décor needs.